This is a wonderful opportunity to renovate a 1984 ranch style home or start from the ground up with a new structure. This very well built home is situated on 1.44 acres of land on the corner of Rabbit Run and Polpis Road. 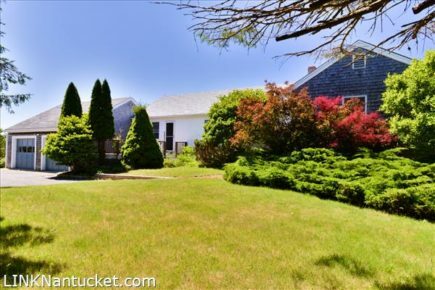 The lot has high elevation and overlooks over 35 acres ++ of Nantucket Conservation Land and has distant harbor views and Great Point Lighthouse views. Enjoy the casual elegance of this exceptional property located on the eastern side of the island offering easy access to ..
‘PRIVATE in POLPIS’ An enchanting and beautifully maintained property, featuring wonderful outdoor living space with established gardens, plus a delightful ..
A pleasant 12 minute drive from the hustle and bustle of Downtown Nantucket transports you to this private, 3+-acre oasis ..